The riveting untold story of the legendary World War II bomber pilot, "cooler king," and arch escape artist. 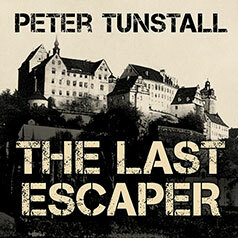 The product of a lifetime's reflection, The Last Escaper is Peter Tunstall's unforgettable memoir of his days in the British Royal Air Force and as one of the most celebrated British POWs of World War II. Tunstall was an infamous tormentor of his German captors. Dubbed the "cooler king" on account of his long spells in solitary, he once dropped a water "bomb" directly in the lap of a high-ranking German officer. He also devised an ingenious method for smuggling coded messages back to London. But above all, he was a highly skilled pilot, loyal friend, and trusted colleague. Without false pride or bitterness, Tunstall recounts the hijinks of training to be a pilot, terrifying bombing raids, and elaborate escape attempts at once hilarious and deadly serious—all part of a poignant and human war story superbly told by a natural raconteur. The Last Escaper is a captivating final testament by the "last man standing" from the Greatest Generation.